The first thing I want to point out is that this map is not drawn to scale. Manhattan is not that wide and Staten Island isn't really that small. 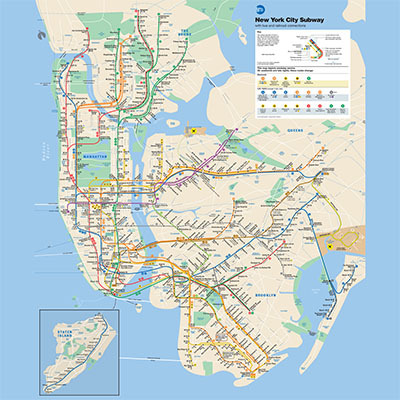 The map is intentionally distorted to highlight the subway lines, stations, and the connections between them. Stations might actually be farther apart or closer together than they appear on this map. The thick, solid colored lines are obviously the subway lines. You can also find on this map a few of the other commuter lines that are not officially part of the subway, such as Long Island Rail Road (LIRR) tracks, buses, and AirTrains -- but let's ignore those for now. As you can see, no subway line ever leaves New York and no physical subway connection exists from Staten Island to the rest of the subway system. Unlike many other subway systems around the world, there are no zones because you pay the same fare regardless of how far or how long your trip is. The cost of going from one station to a neighboring station (say, a one-minute ride) is the same as traveling from one end of the map to the other (which might take two hours). As you can see, each line has a name and a specific color. 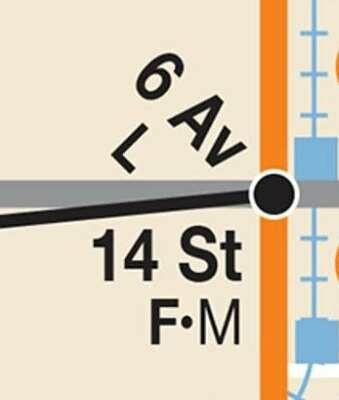 The 8th Ave line for instance is always blue, while the Broadway - 7th Ave line is always red. Don't worry about the line names too much. Even locals often don't know the official name of a given line (and you'll see later why). Within each line, there are a few services which are each designated with a single letter or a single number. We also refer to these services also as just "trains". For instance, within the "blue" 8th Ave line there are three services which are A, C and E. These three services are grouped into this "blue" 8th Ave line, because they share a common tunnel/avenue/street at some point on their journey (8th Ave). However, these three trains have different starting and/or ending stations. Similarly, the 1, 2 and 3 services on the "red" Broadway-7th Ave line run along Broadway and 7th Ave, but they do start and end at different stations. I should pause here and note that while it might be tempting to use these colored lines to describe directions, you ought to be using the single letter/number designation for the the specific services instead. It's confusing to say that you are taking the "blue" 8th Ave line, because the three services within them (A, C and E) go to entirely different endpoints and even stop at different stations on the same shared path. This is the reason why locals don't refer to lines by their names or even color. People never say, "Take the green" or "Take the red line"; Instead they say, "Take the 4 train" or "Take the 2 train". Even though a line and a service have different meanings, you will find that colloquially the word "line" is sometimes used when "service" or "train" is meant. For instance, "Let's take the 4 line to Yankee Stadium" is technically incorrect, but the single number 4 implies that we are talking about the 4 service. Trains are either express or local. Express trains skip certain stations for faster service, while local trains stop at every station along their path. From the above table, you can see that the 2 and 3 trains are generally express trains, but the 1 train is a local train. Similarly, on the 8th Ave line, the A train will generally run express while the C train will always run local. Unfortunately, trains are not reliably express or local along their entire route. An express train can become a local train at some time. This transition is very subtle and you would not even notice while riding the train. The transition from express to local service usually occurs when train services split from their shared portion of the track. For instance, the 1, 2 and 3 trains share a common track between 96th St station uptown and Chamber St. downtown. Between those two stations, the 2 and 3 trains run express and will skip certain stations. 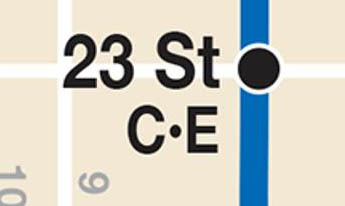 However, right after Chamber St, where the 2 and 3 trains split from the 1 train, they become local trains and will stop at every stop thereafter. To make matters worse, some train services, such as the 6 or 7, can either be express or local depending on the time and direction of travel, which is why for those lines only, their icon can be either a circle (local) or a diamond (express). Don’t worry if this all sounds confusing to you -- it certainly is, but I will explain later a better way to determine if a train will stop at a certain station. A station with a black dot means that only local trains stop here; express trains skip this station. Trains that stop here are listed underneath the station name. In the example above, it's the C as well as E train. This makes sense because those are considered local trains. A station with a white dot means that both the local and express trains stop at this station. In other words, all trains stop here all the time. In the example above, the express 4 and 5 trains stop here as well as the local 6 train. I already mentioned that station names are not unique (different stations carry the same name). Unfortunately, the reverse is true as well: the same physical station can have different names, depending on which train you are taking. The station shown in the picture above will be announced as the 6th Ave. station if you are coming from the L train but it will be announced as the 14th St. station if you are coming from the F or M train. You might notice that the letter M is not boldfaced in the picture above. Subway service names that are not boldfaced indicate stops that are not serviced full-time. Consult the online schedule to determine when the part-time service commences or ends. For instance, the M train does not operate at night or on weekends in Manhattan, which is why the letter M is not boldfaced in the above picture. A solid black line between two stations means that there exists a physical passageway (usually a tunnel) allowing you to transfer between subway lines without leaving the subway system or requiring you to swipe your MetroCard again. Notice how the 51st St. station is a local stop on the 6 service but the Lexington Ave./53rd St. station is an express stop on the E and M service. Putting this knowledge together, I hope you can deduce from this picture that the A and C trains stop at Chambers St., the 2 and 3 trains stop at Park Place, and the E train stops at the World Trade Center - and all three stations are connected to one another by free tunnels. 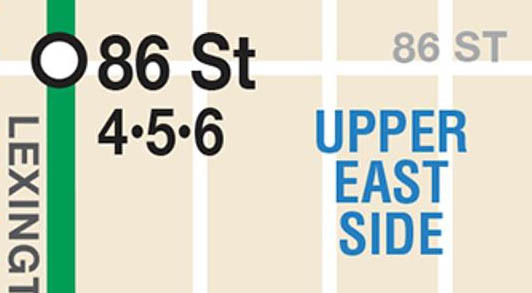 Don't expect to understand the New York subway map immediately. It's a dense document conveying perhaps more information than you need to get from point A to point B. The most important things to pay attention to when looking at this map are the train numbers or letters shown below the subway station names.